Teaching our next generation of physicians remains a crucial component of the Faculty of Medicine’s Strategic Plan, Building the Future. Our teachers inspire our learners and are the role models for the next generation of healthcare professionals. A UBC faculty appointment is a requirement for all teachers in the MD Undergraduate Program. 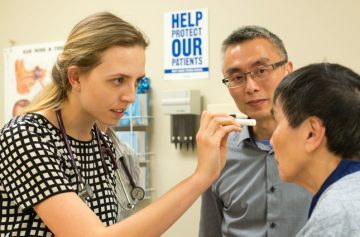 For more information on clinical faculty appointments, visit the clinical faculty section on the Faculty of Medicine’s website or contact us by email at md.undergraduate@ubc.ca. The MD Undergraduate Program has a wide range of opportunities for teaching at sites across B.C. For more information on any of these opportunities and how to get involved please contact us by email at md.undergraduate@ubc.ca. Clinical teaching in the MD Undergraduate Program is compensated according to the Faculty of Medicine Clinical Faculty Compensation Terms. The MD Undergraduate Program fully supports the ongoing development of its teachers. For more information on the faculty development opportunities that are available, please see the Faculty Development website.